After nine months of hard work (and plenty of fretting), we have a new baby. Since January we have been working hard to prepare for the migration of our forums off vBulletin and onto the Discourse platform. The time has come to flick the switch and like any new parent, I’m a bit overexcited about the whole thing! 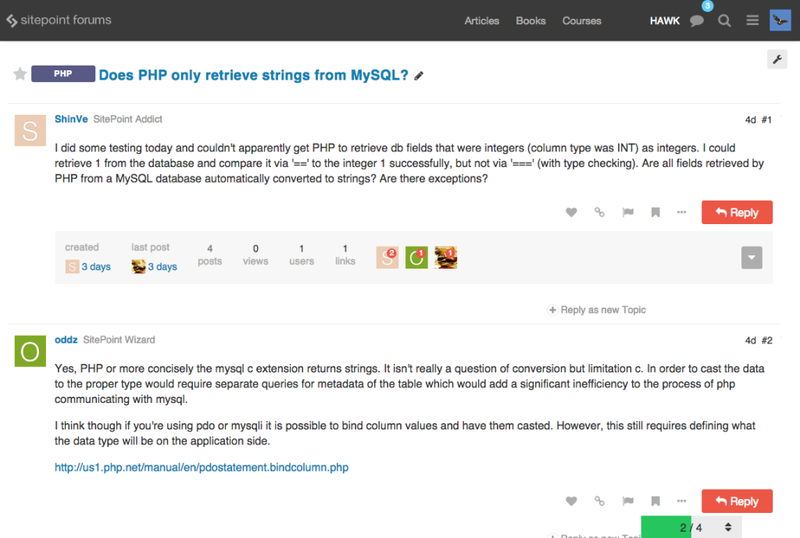 Discourse is an exciting new forum frontier, and SitePoint on Discourse is a thing of true beauty. I appreciate that design is subjective (and everyone thinks that their own baby is beautiful), and for every one of you that loves our new look, there will likely be someone that doesn’t like it so much. That’s absolutely fine and I’m interested in your feedback, but please make it constructive. There is a feedback thread here. So… how do I access this thing of beauty? Good question. You’ll find the new forum here. If you have been active in our vBulletin forum in the last 5 years then we have migrated your existing user account over. Provided your email address was up to date in vBulletin, you should have received an email from us by now with instructions on how to log in and reset your password. If you have any problems with that process, email forums@sitepoint.com and we’ll sort it out. If you’ve been active but didn’t receive an email from us (and you’ve checked your spam folder), it may be that we have the wrong email address for you. In that case you have a couple of options. You can try logging in to Discourse with your existing vBulletin username and request a password change. If that doesn’t work then you can contact forums@sitepoint.com and ask for assistance. If you’ve not been active for more than 5 years, or are new to our community, feel free to sign up to Discourse with a new account. Note that if you sign up with a new account when you already have an existing one, any migrated posts will remain associated with your old account. Why doesn’t my old username work? Discourse has more restrictive rules for usernames than vBulletin, which means that some usernames may have been altered in the migration. If you think yours may have been affected, you can read more about the new username rules here. If your username doesn’t fit into these rules, it may have had characters stripped from it, or it may not have been migrated at all. Contact forums@sitepoint.com if you need help finding your new account. Wow. This looks really different. How does it work? There are a number of helpful documents that will get you underway. You’ll find links to them in the Discourse welcome banner (which you can close once you know your way around). The FAQ document outlines our guidelines and rules for posting, and can be found in the secondary navigation bar at the top of the forum. The category map explains where to find and post different subjects and which tags to apply. The handy Discourse Cheat Sheet explains how to get your head around how to do things the Discourse way. And lastly, here is an explanation of Trust Levels, which are a core part of the Discourse experience. Note that regardless of whether you have a migrated account, or you open a new one, you will start off at Trust Level 0 (just so you can learn the ropes). It doesn’t take long to jump up the ranks. Where can I find a real person to help me? The following links will take you to the staff pages, where you’ll be able to see who is currently online. Clicking on a name will take you to that person’s profile page, where you’ll find a big red Private Message button. Any staff member will be able to help you out, or at least point you in the right direction. Administrators (people who can help you with technical things like username changes). Advisors (moderators who can give you advice and move your topics around). Mentors (super helpful people who can give you a hand finding your way around but can’t perform moderation tasks). A couple of things have new names in Discourse, and it’s handy to start thinking in those terms. What we used to call a forum or a sub-forum in vBulletin is now called a category. What we used to call a thread in vBulletin is now called a topic. The all new Showcase is a place where you can self-promote to your heart’s content, provided youâ€™ve been around for long enough to show us that you really want to be a part of the community â€“ itâ€™s based on the new Trust Levels. Then thereâ€™s the new Jobs category. Ever since we did away with the SitePoint Marketplace, there hasnâ€™t really been anywhere for you to find the right person to help you out with building a script or a plugin, so weâ€™re rectifying that by giving you a place to advertise for help. (Note that you can’t advertise the services that you have on offer, only your requirements). You don’t. Many of you will feel annoyed about this and some will want to debate it. It’s not open to negotiation. Discourse doesn’t support signatures and we’re good with that. What you can do is customise your profile page to display a link to your site. To do that, click on your avatar at the top right of the screen, select Profile from the drop down menu, and then click the Preferences button. One of my favorite things about Discourse is how much control it gives you to influence behavior in the community. Click this when you see a post that you like. Click this if you see a post that you don’t like. Discourse will take care of the rest. You can read more about liking and flagging here. So there you have it. 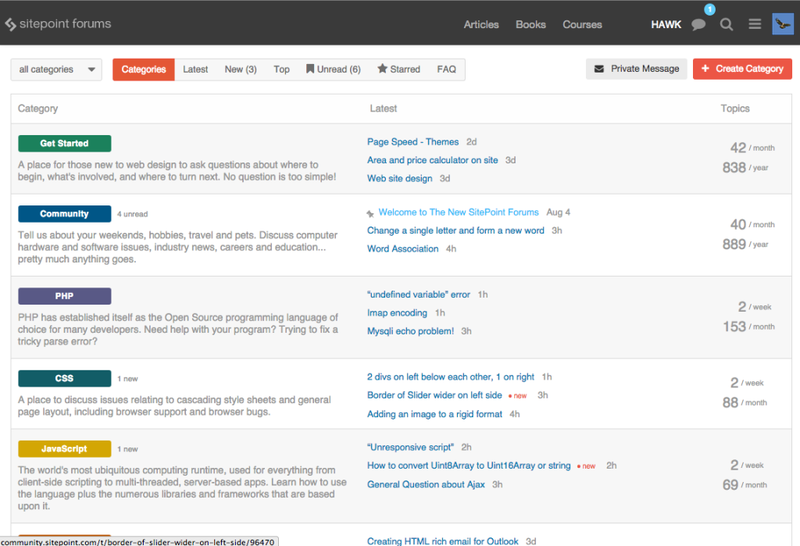 The all new shiny SitePoint Forums are alive and kicking.